October means it’s officially the start of the holiday party season! From food to drinks and ghoulish decor, there are endless options for creating the perfect Monster Mash that your guests will be talking about until next Halloween. First things first, embrace the versatility of a bar cart. 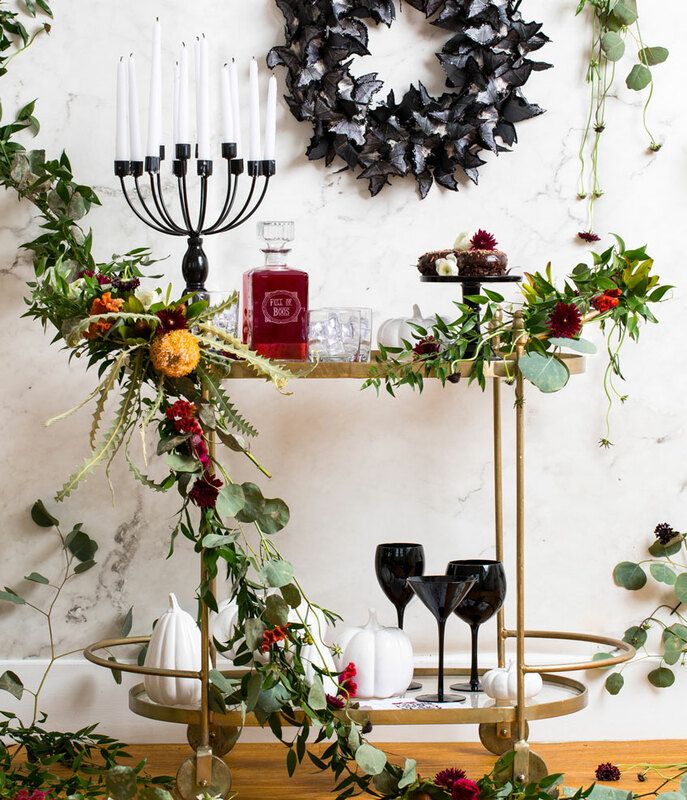 It’s no secret that any great party revolves around the food and drink, and you can decorate and spice up your bar cart to transform your entire party. Start with a stunning bar cart for your base like the Wildwood Home Maxwell Bar Cart or the Chelsea House Home Bar Cart - White. From there, add flowers and garland to dress up the metal accents. Next, add a spooky candelabra and a gothic inspired punch bowl and spoon like the Arte Italica Home Taverna Basin Bowl and Arte Italica Home Taverna Decorative Spoon. Complete the ghoulish bar cart with a few glowing candles and votives and of course plenty of glassware. 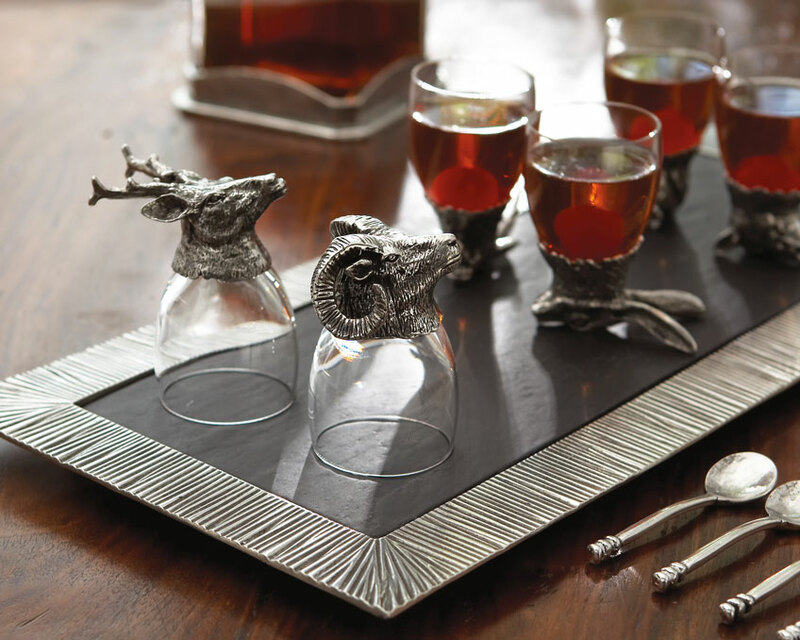 Choose glasses with vintage and gothic style like these Arte Italica Home Animale Ram Liqueur Glasses that feature pewter animal figurines. Another great use of a bar cart is to turn it into a grown-up version of trick-or-treating with a candy cart! Fill vases and pitchers with sophisticated gummy candies and other tasty treats for guests to choose for their own personal goodie bags! For beverages, there are plenty of options for fun and festive drinks that embrace the Halloween theme. Serve Pumpkin Pie Punch for a fun twist on the classic fall dessert. (recipe https://www.delish.com/cooking/recipe-ideas/recipes/a44183/spiked-pumpkin-pie-punch-recipe/) Serve your beverage in a large punch bowl and place plenty of glasses nearby for guests to make themselves a drink. Clear and gothic glasses like the Arte Italica Home Giorgio DOF Glass or the Arte Italica Home Cavallo Beverage Glass are perfect for enjoying this festive cocktail. Hello to Halloween Playlist. Listen Now! What’s a party without a bopping playlist? Set up a bluetooth speaker in a central location and make sure to check out our Halloween playlist. We’ve curated all of the best tunes so all you have to do is click play and we’ll handle the rest! To continue creating a creepy atmosphere, find some scary family pictures online and print and frame them for an antique haunted house look. Print photos in a vintage sepia tone and place in an antique looking frame like the Regina Andrew Design Home Vintage Metal Photo Holders. Set up different room dividers to separate out bigger rooms and make your party feel like a haunted house! Screens like the Chelsea House Home Landscape Screen can help create the illusion of different rooms to add on to the spook. And don’t forget lighting! Nothing creates an eerie vibe like candle lighting, so kill the overhead lights and use plenty of lanterns, candelabras, and flickering candlesto set the mood. Focus on candles with metal designs and strong colors like black and red to create your ideal atmosphere. 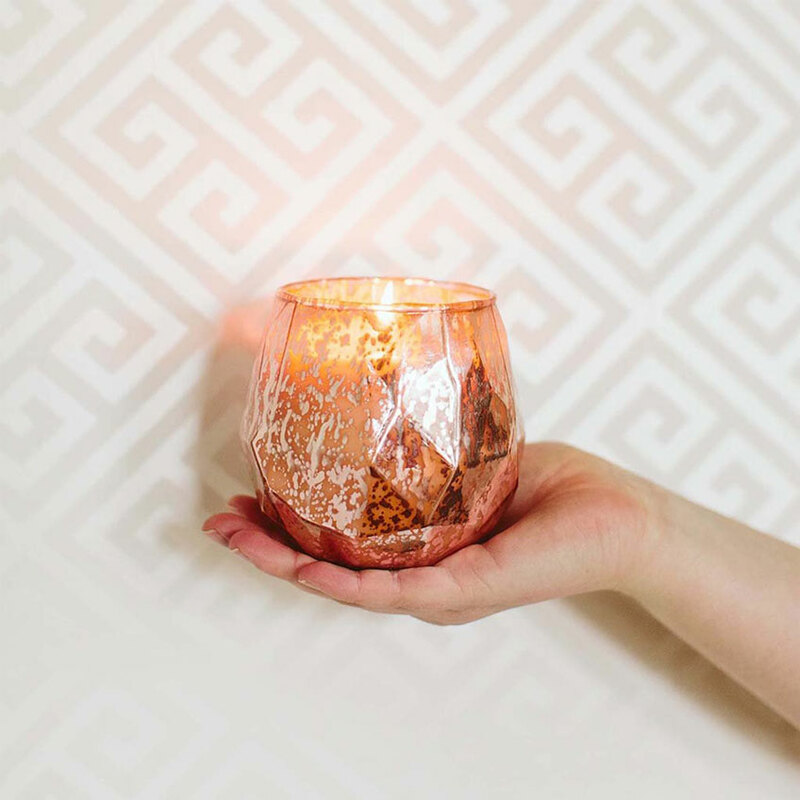 Mix and match candles like the Sweet Grace By Bridgewater Candle 15.8 oz Rose Gold and the Votivo Red Currant Collection in Red Opulence for a look that’s sure to spook!